We join Zoë and Simon as they talk us through their big day. 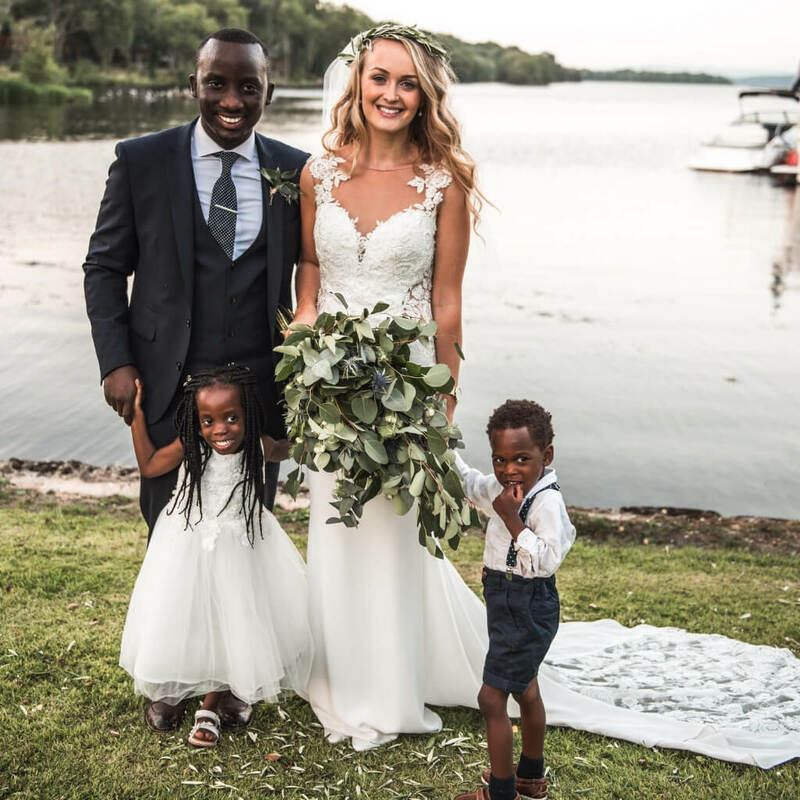 Zoë Deazley and Simon Matovu met a couple of years after Zoë visited Uganda to volunteer with a charity, where she immediately felt at home with the people and culture. Although they lived thousands of miles apart and came from very different cultures, they both agreed to keep the friendship alive as something special had just started. 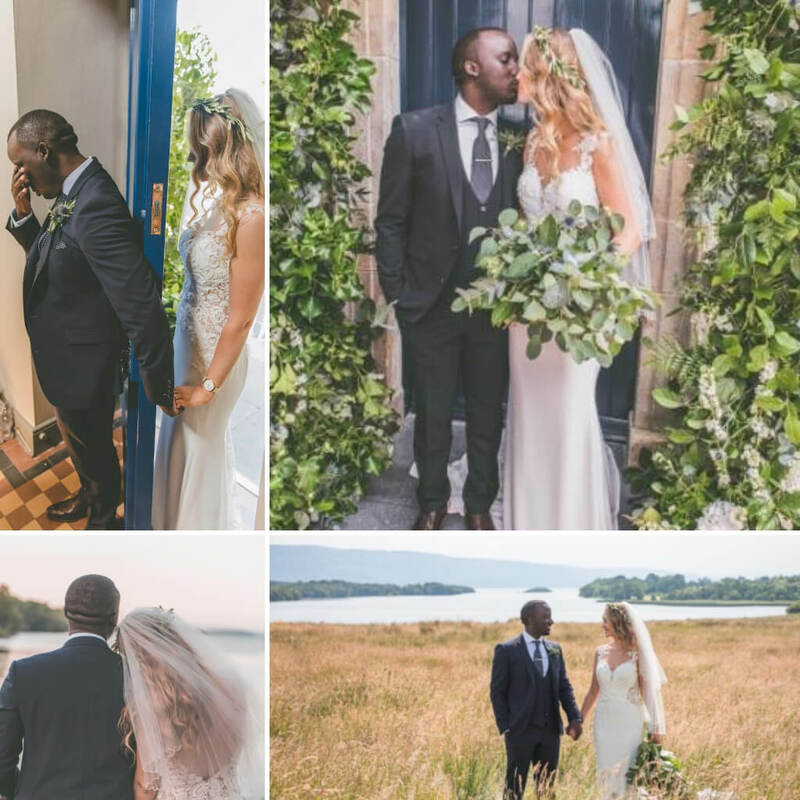 Zoë had to return to Ireland to finish her University degree but that didn’t stop the communication between Simon and her, with Zoë always feeling he was there with her since they spoke on the phone up to fifteen times a day! It wasn’t long before they were in a relationship and the travelling back and forth began. Zoë found an offer online for a couple’s photo shoot, being a huge fan of photography she jumped at the chance and booked it. 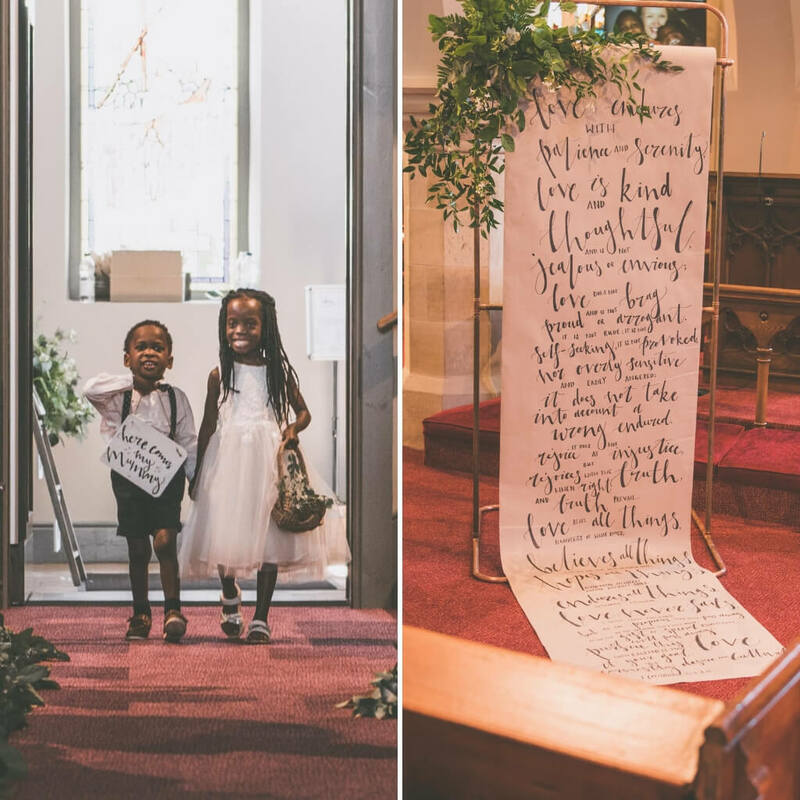 She treasures photos as they have the ability to show so much emotion and share a story. Unknown to her, Simon had been planning a surprise proposal! She had no idea he already had picked out a ring. The photoshoot took place on the grounds of Mussenden Temple near Benone, Co. Londonderry. Zoë remembers being really nervous for the photo shoot and thought the second photographer arranged by Simon to take sneaky photos was another tourist! Simon had arranged for there to be candles and rose petals inside the temple, how romantic! 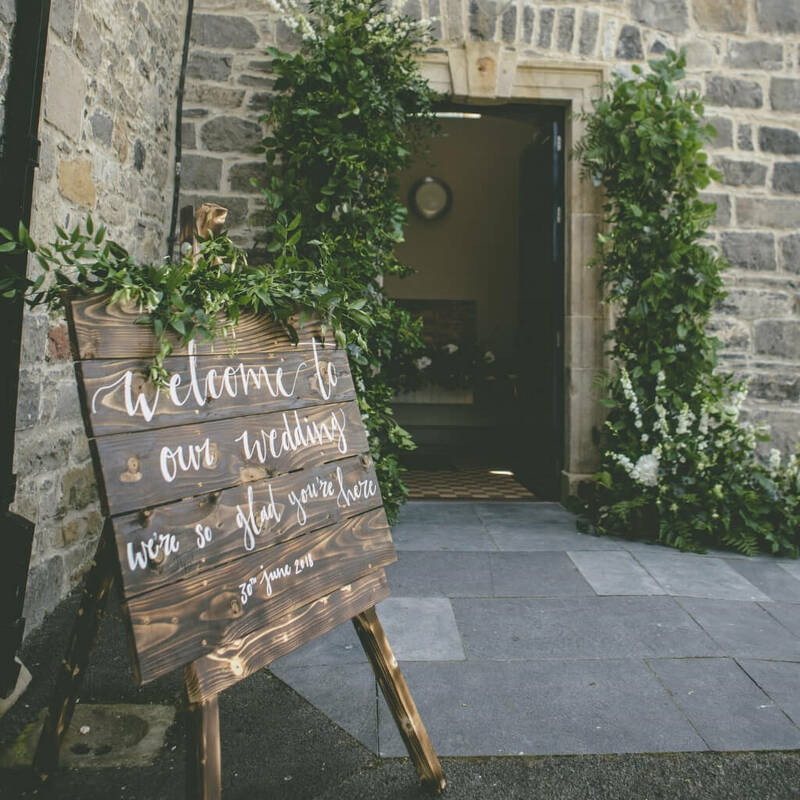 Zoë and Simon chose Lusty Beg Island Resort as their venue as they really wanted a relaxed and rustic summer atmosphere and thought Lusty Beg was the perfect fit. 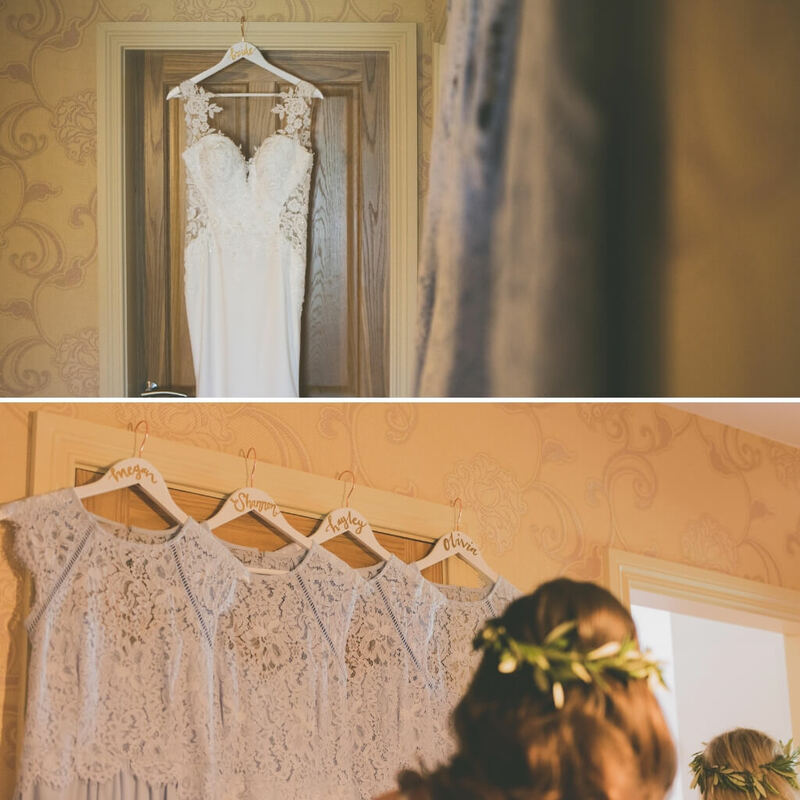 The young couple chose a bohemian theme, as Zoë loves the classy, elegant twist it has. 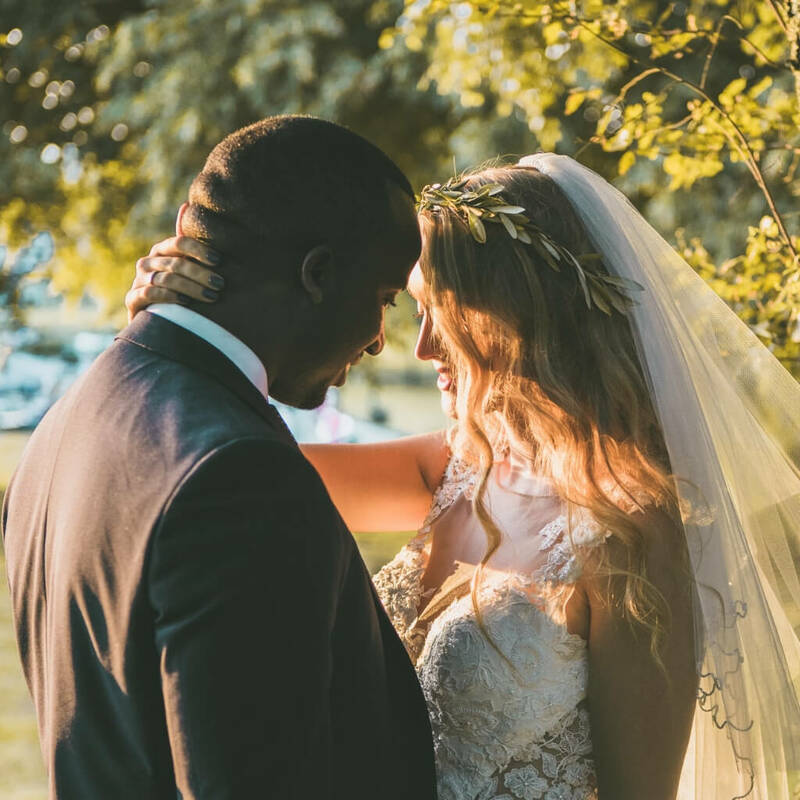 She also incorporated a whimsical feel to the day with the use of foliage, hair crowns and wooden decorations; perfect for a hot summer wedding. 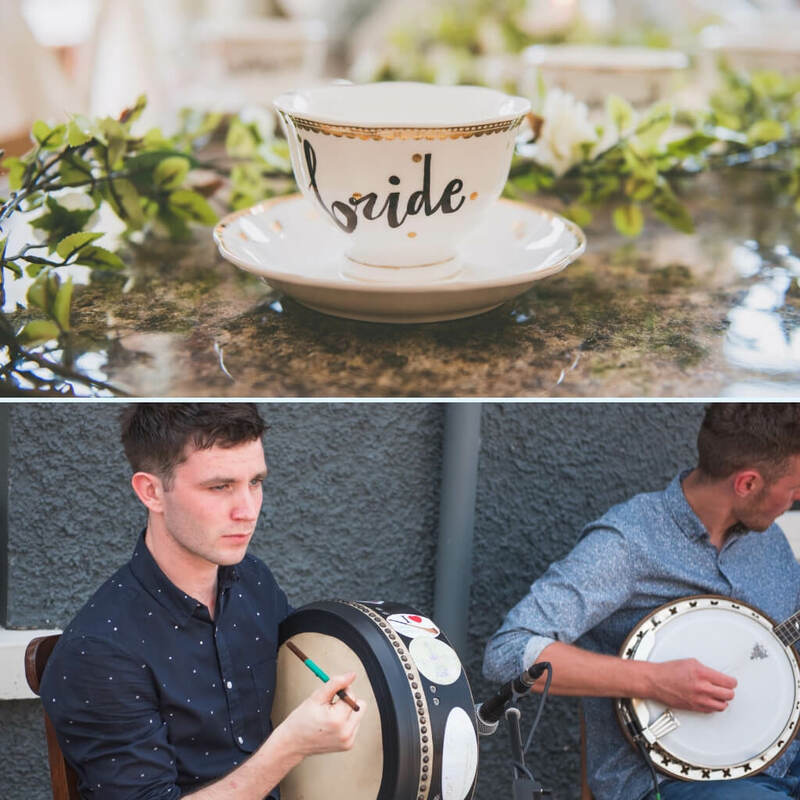 Another thing close to their hearts was incorporating both sides of their cultures, and it was achieved with many little cultural elements; such as a Ugandan Coffee Bar and Africa shaped shortbread on arrival to the Lusty Beg. At the end of the night there was an Ireland versus Uganda dance off between the bridal party, made possible by The Coves, an Irish folk band hired for the evening. The bridesmaid’s dresses were from the online retailer website, ASOS. Zoë wanted to find something a little different, but a dusty, vintage blue was always the colour on her mind. The dresses found on ASOS paired with gold jewellery and shoes tied in so well with the relaxed, whimsical vibe of the day and was exactly the look Zoë imagined. The men‘s suits were from Tom Morrow’s Shop in Dungannon, Co Tyrone, who were extremely helpful in the process of selecting the attire. 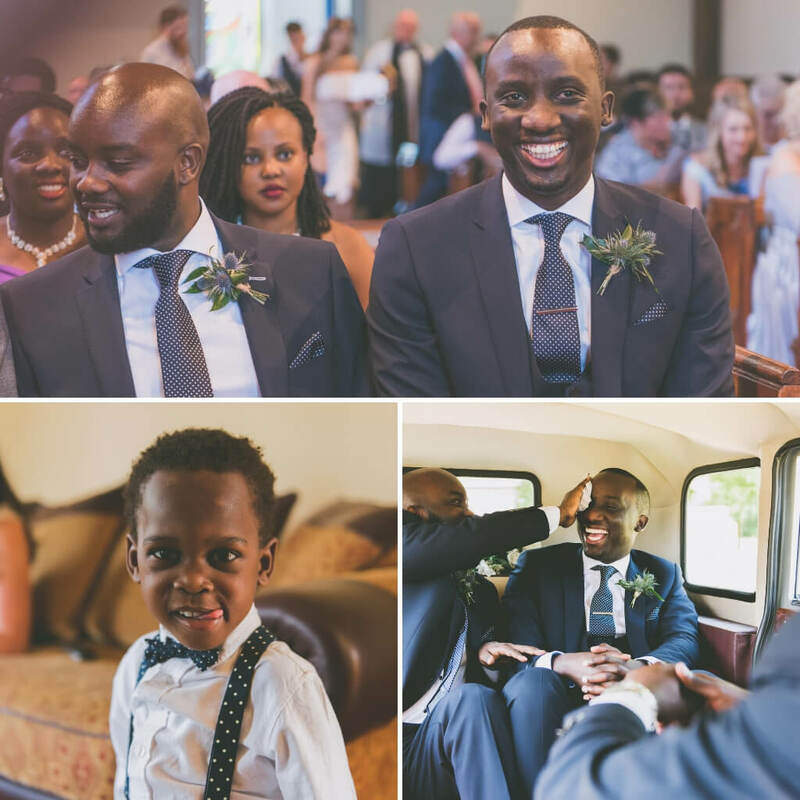 The men were dressed in dark navy suits paired with slick navy and white polka dot ties that complemented the blue bridesmaids perfectly. Zoë and Simon picked Nettles and Petals from Fintona Co. Tyrone, with Roisin creating their dreamy, rustic look. Zoë admits she’s not a big lover of bright colours and preferred the foliage look as it reminds her of her home. 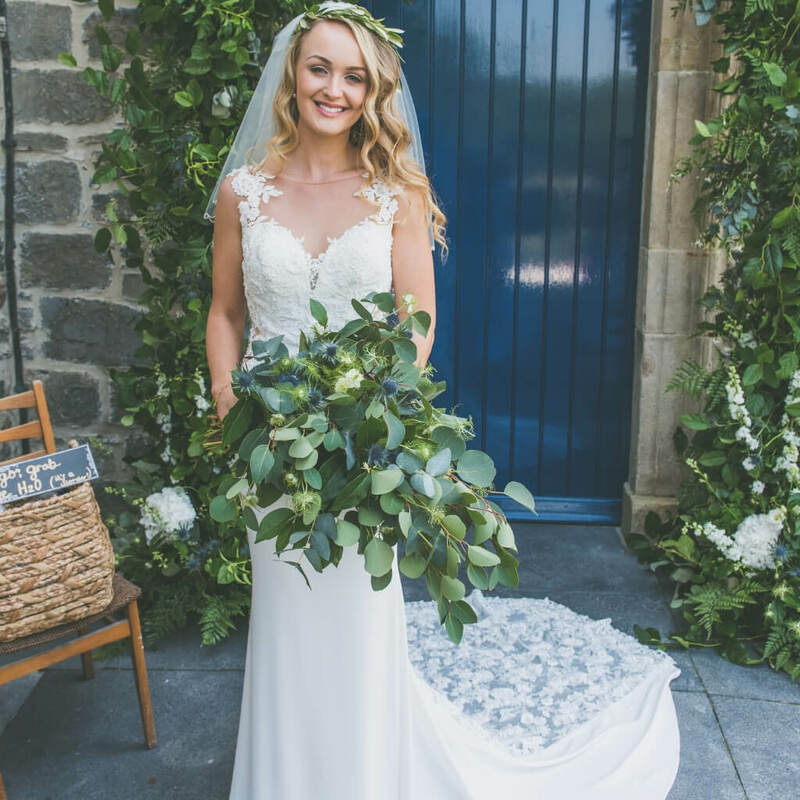 ‘I love greenery at a wedding, it looks timeless in photographs,’ comments Zoë. Outside Simon’s parent’s home, there is an Olive Leaf Tree that reminds Zoë of home every time she sees it. 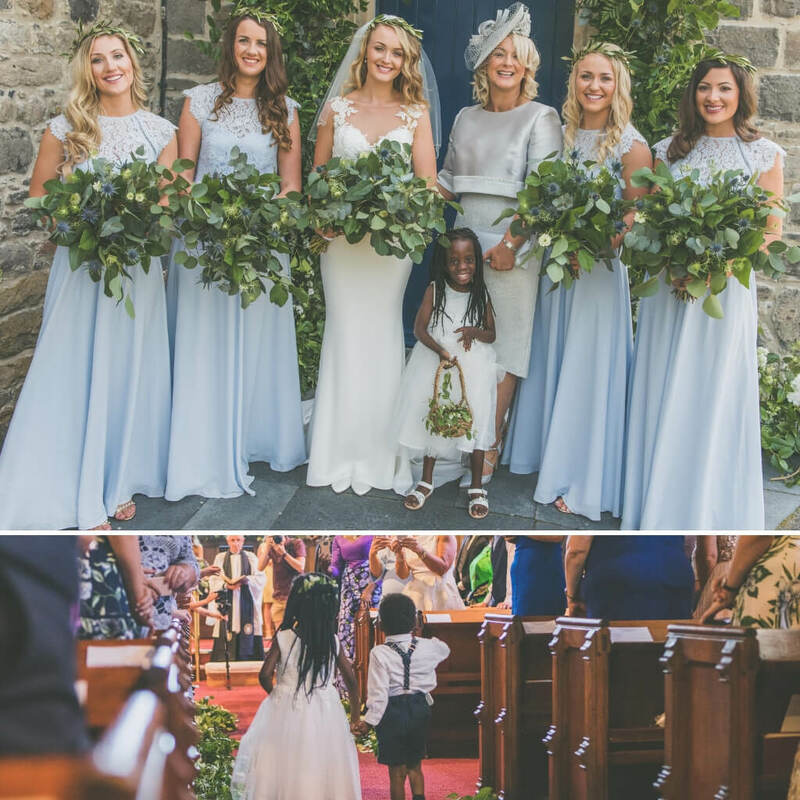 The Olive Leaf was a part of the foliage in the bouquets as well as a navy-blue Irish thistle that matched the blue bridesmaids dresses. Zoë ’s friend Danielle, from Keyhole Creations brought to life exactly what was in Zoë ’s head. 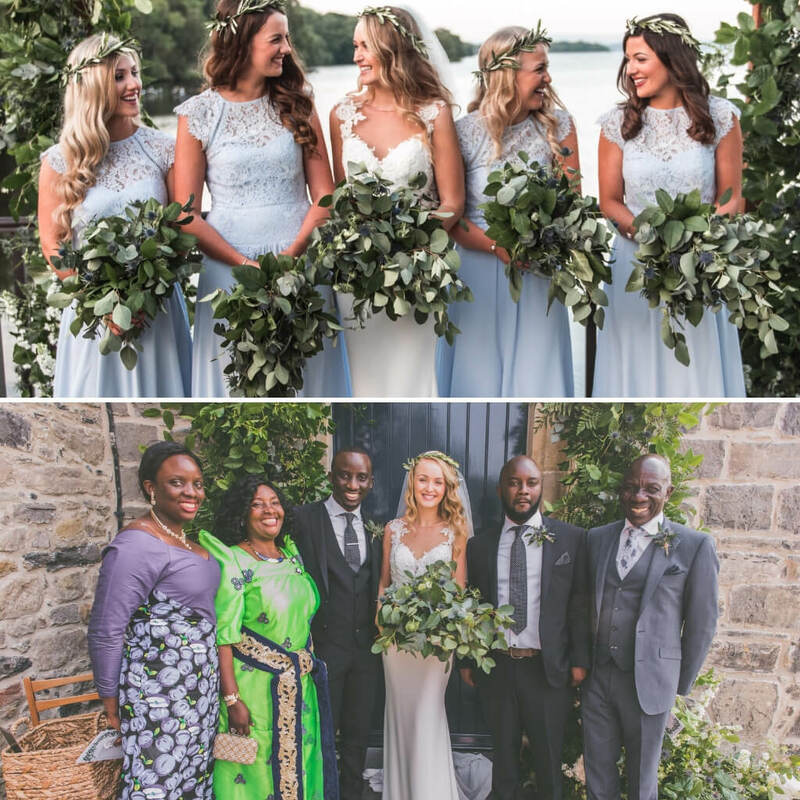 ‘For me, stationery sets the scene pre-wedding and I really wanted it to reflect us as a couple, our cultures and our wedding day.’ All of the stationery featured a foliage garland with a little hint of blue to match with the colour scheme. 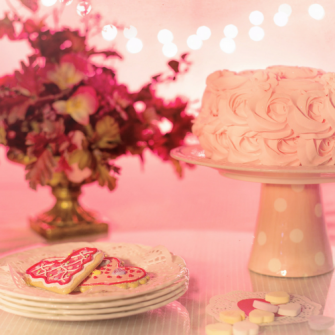 The table setting was mounted on a dark wooden stand handmade by Zoë’s uncle and decorated by the florist. The invitations and table menus featured an outlined golden image of the continent of Africa. 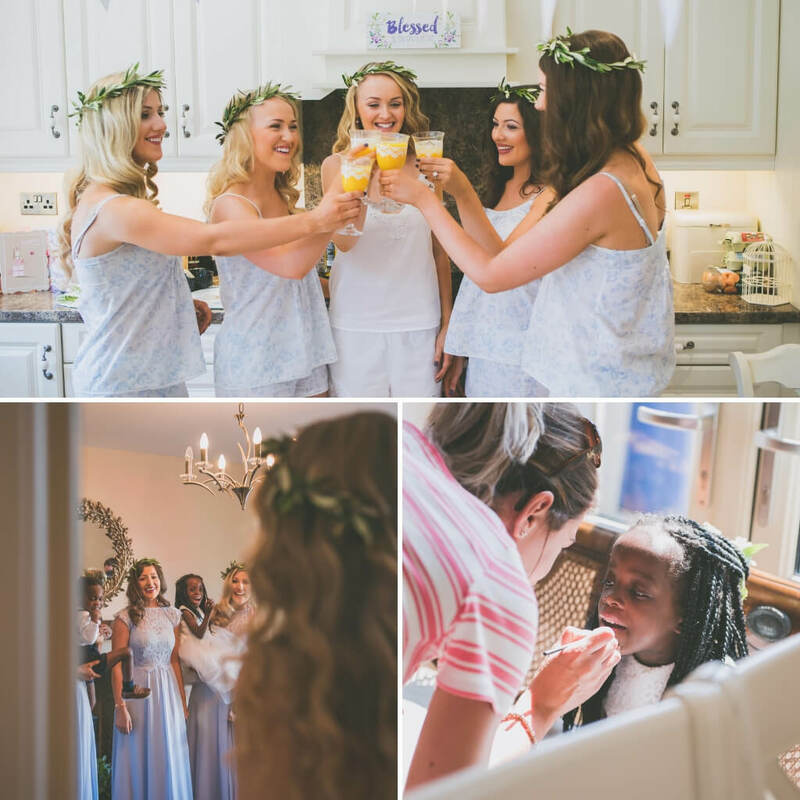 A natural born decorator and creative thinker, Zoë wanted to bring many aspects together to create a day that was both beautiful and enjoyed by the guests! 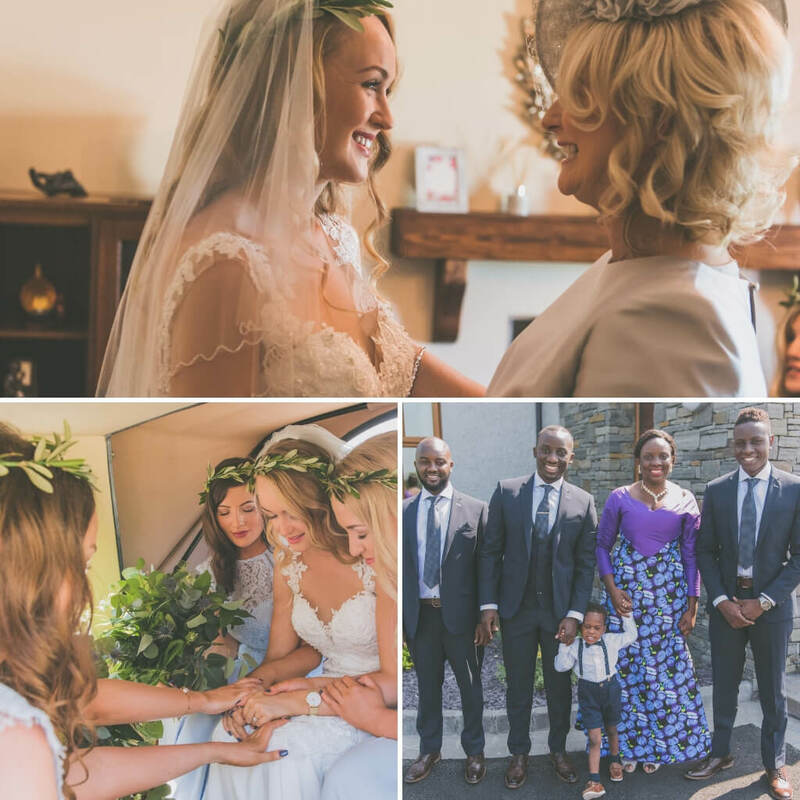 Even though Zoë was in Uganda working for Obulamu Ministries, she managed to plan the perfect day with keeping in contact with suppliers and with the help of her amazing Mum, who had a great part to play in the wedding and went along with any crazy ideas Zoë had! 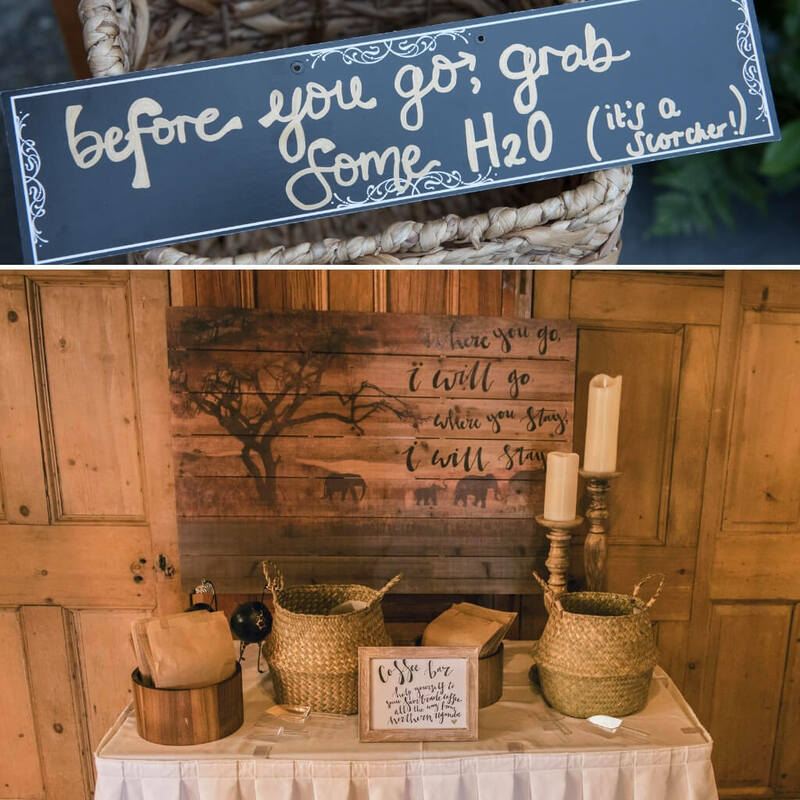 They added to the already rustic hall with fairy lights along the roof from McGarry Lights and Flowers, and there also stood a brass stand made by Zoë’s uncle beside the cake stand, which held a scroll with 1 Corinthians 13’s ‘Love is’ transcribed by Zoë’s friend Chloe from Bible College, which also stood at the front of the church as they said their vows. 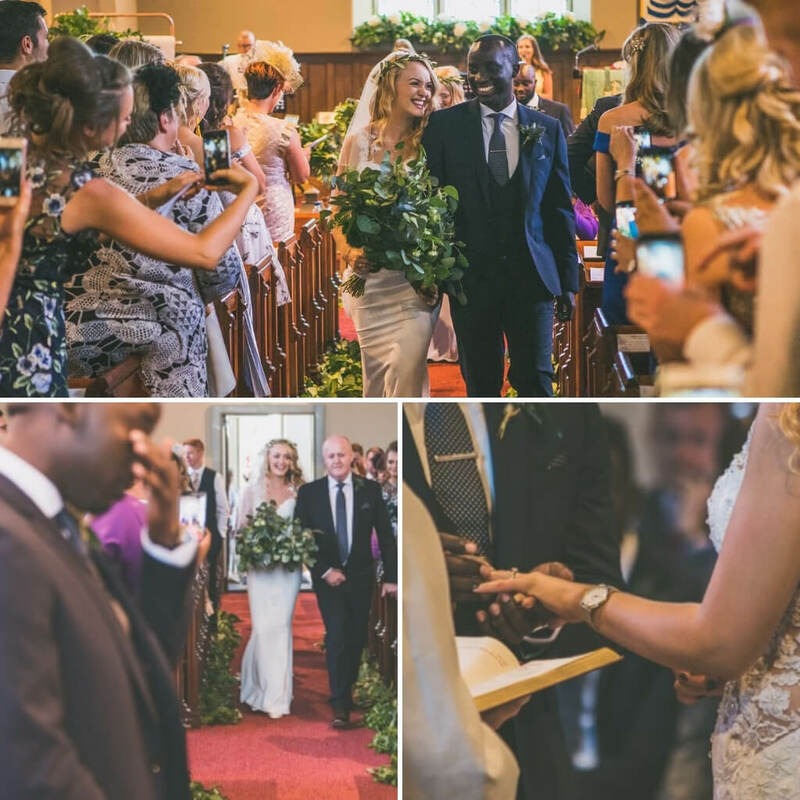 The photographer who captured Zoë and Simon’s big day were Han & Dan Media. 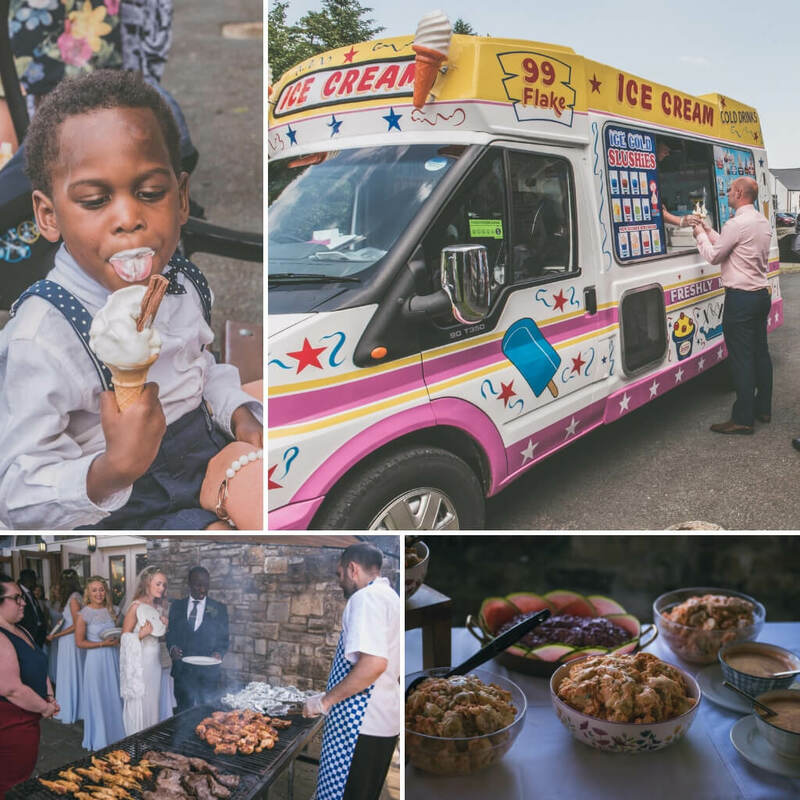 Due to the date of their wedding and the possibility of very hot weather, Zoë and Simon opted for a less traditional menu and decided instead to choose a gourmet barbecue feast, as they are both big lovers of summer food. ‘Lusty Beg were very obliging and drew up a gourmet menu which had every guest raving about for weeks!’ they said. For starters they had a variety of fresh breads with an option of dips to include Balsamic Vinegar, Olive oil, Tapenade and Sun-dried Tomato pesto. Then their main consisted of Luxury Buffet BBQ of Chicken Satay Kebab, Tandoori Chicken Leg, Salmon with Coconut, Lime and Garlic or Sirloin Steak with Brown Sugar, Miso and Chinese Spice that came with delicious sides of seasonal roasted vegetables such as butternut squash and peppers, pomegranate salad, baby and sweet potato salad and more. For dessert they had white and milk chocolate brownies with vanilla ice cream and chocolate sauce. When it came to the cake, Zoë knew she wanted to visit Caledon Cake Studio, it didn’t take her long to choose her perfect cake. ‘Jill is so skilled at what she does. I had to try to choose something not too sweet as Ugandan’s don’t have a sweet tooth but when Jill convinced me to try her raspberry and white chocolate sample, I was hooked!’ Zoë comments. 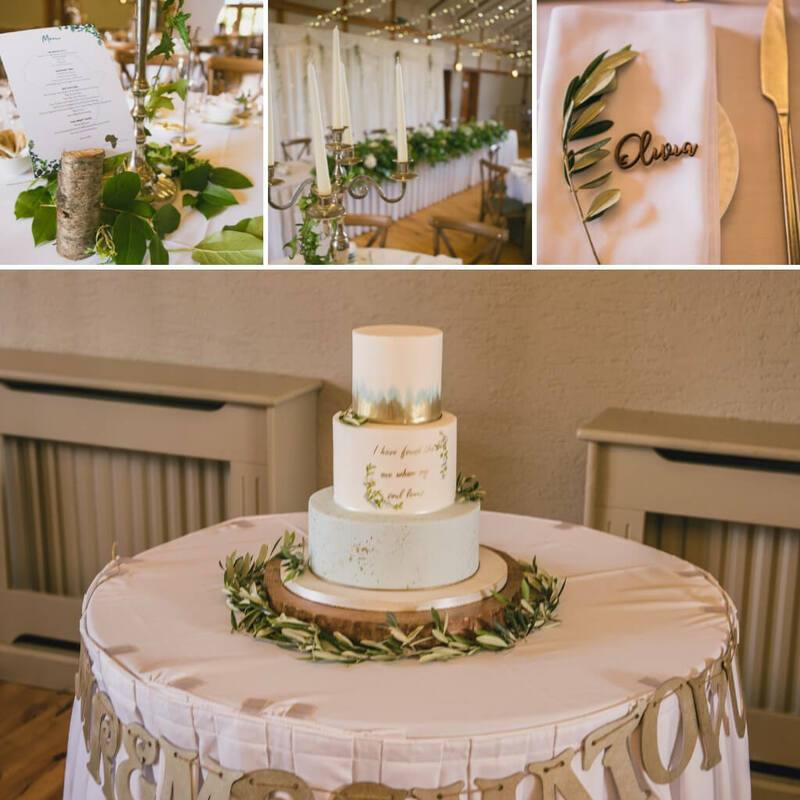 The cake’s style was simple with a hint of vintage blue and gold and a favourite Scripture verse ‘I’ve found the one whom my soul loves’ written in gold to finish off her dream cake.